Help us solve this mystery smell! I've been reading through this forum all day and have learned a lot. Thanks to everyone here! Our situation: We just bought a hundred year old house in NJ with a steam boiler system (which we also have at our current home). 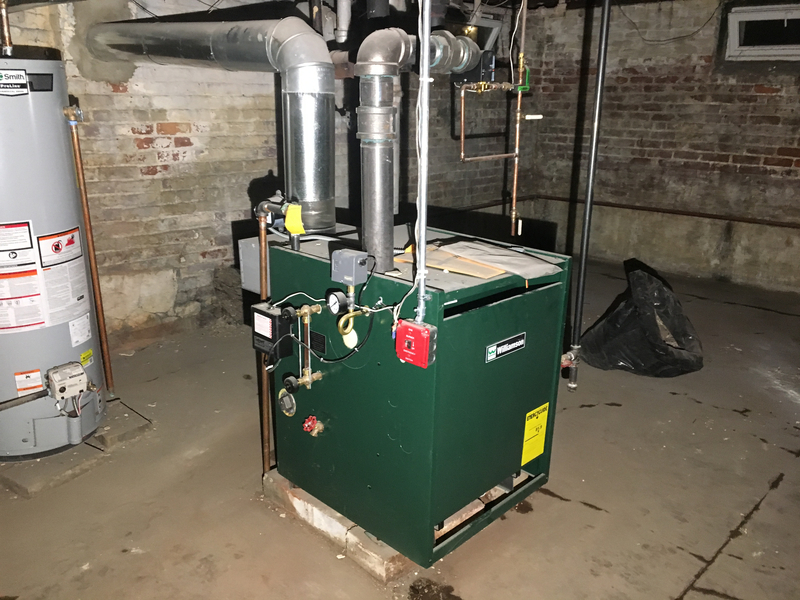 We're experiencing a terrible smell that started after we installed a new steam boiler. The old one was shot (had visible holes to the chamber) so we had to install this before we closed on the house. Up until then, there was no odor in the house. 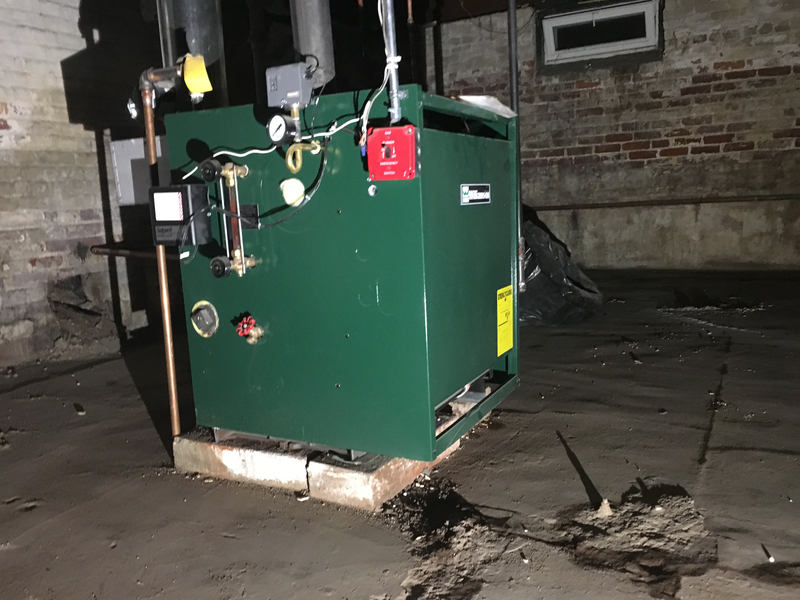 Our plumbers have even stated that it did NOT smell in the basement or anywhere while they were installing the new boiler. Since installation, there is a horrible smell that is hard to describe, even after reading all of the descriptions on here. Our smell is not rotten eggs. It's not musty. It's sickly sweet and almost vomit-like. Cleaners who came in assumed the house must have had cats, but there were no pets or smoking, and as I said, no smell until this new boiler. We smell it most in the basement and in the front and back foyers on the first floor. It fades as you go up, and you can't smell it at all on the third floor. When we walk through the front door, sometimes it's so strong that it makes me nauseous. Our plumber is perplexed but is coming back Tuesday to open the boiler and check everything. Luckily, we aren't living in the house yet, but I can't move my kids in there with this smell, and I'm worried that we won't be able to identify where it's coming from. We spent 3 days with the heat turned down and the windows open airing the house out. While the doors are open, it seems a little better, but when we close it up the smell returns, which makes me think the smell is being actively produced by a leak of some sort. We checked the vent stack, no leaks. The sewer lines are all intact and caps in place (plus, it really doesn't smell like sewer). 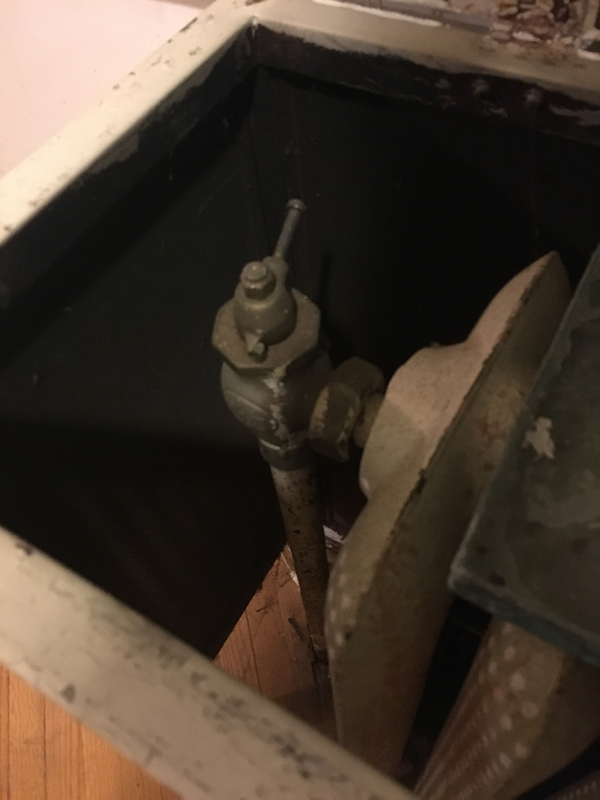 The large radiator pipes in the basement and the furnace itself all smell bad when the system is hot, but that might just be whatever gas this is interacting with the heat. Any ideas? We feel like we've read the entire internet trying to solve this and we aren't getting anywhere. I'm not at the house now, but hopefully I can post some pictures of the furnace tomorrow. - Were any of the pipes (new or old) insulated with something that isn't compatible with the high heat of steam? - Was any cleaner added to the boiler water to help remove manufacturing oils? - Has the new boiler been skimmed and drained and refilled? These are the things I'd start with. pipe dope or thread tape? An animal, recently deceased, somewhere in the basement? Maybe the main vents are inadequate, forcing all the boiler air out through the radiator vents. The probable lack of proper boiler cleaning could also be a contributing factor. We were cleaning out a basement, because of a smell, and had plastic bags full of trash left on the basement floor, waiting for pickup. -Was there any chemicals added to the boiler? -During the new installation was the smoke pipe left open and unattended for a period of time to allow for an animal to crawl in and die in the chimney? -Was anything left in the chimney? -Is there a floor drain near the new boiler that has lost its prime? ie. water vacuumed out of it exposing sewer gas. -any new or old house or pipe insulation wet or with stains on it, discoloring? -Is there a sump pump and sump pit near by? -Is there any plumbing fixtures near by? Try to describe the smell in further detail if you can. What about the "Blue Monster "tape that was thought to be a problem some time ago? Was that a real issue or was that debunked? Thanks for all of the thoughts. We are making a list to check everything, but my husband is now swearing that the old system was actually a *hot water* system...he remembers the home inspector saying that. 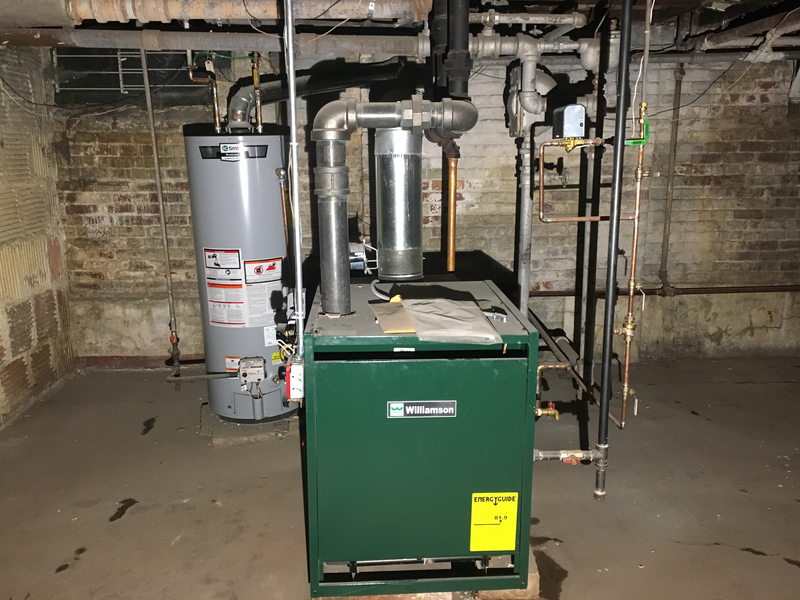 But in the inspector's report, it said "steam boiler" and so we didn't blink when the plumber put in a new steam boiler. 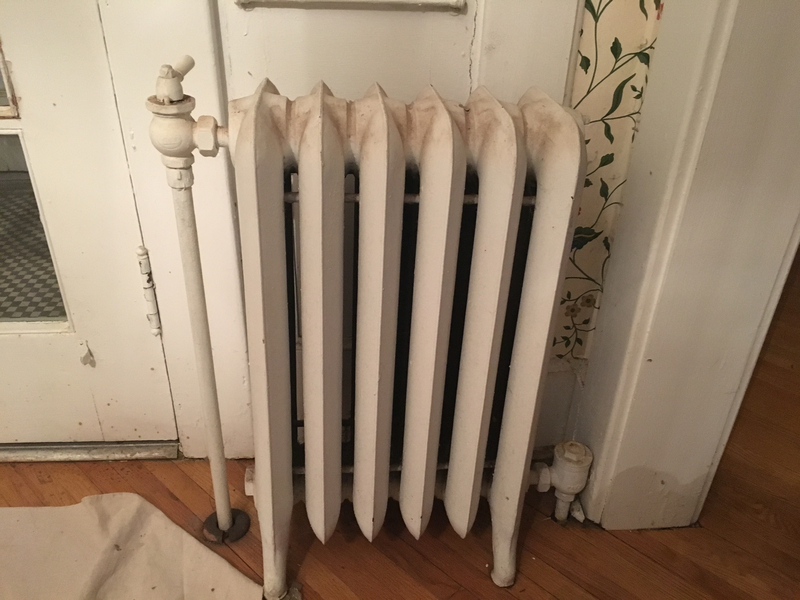 If this system was switched from hot water to steam could that cause weird issues like smells? Because it seems like it's coming off the pipes, like they are too hot. And steam is hotter than hot water! UGH. There is asbestos wrap over the pipes in the basement that needs to be remediated. I'll have to ask about cleaner and skimming. We are going to check the tape for that blue monster stuff other people said was an issue. Our plumber's going to open the furnace box to see if something crawled in there, but we gutted the entire basement this week. Removed all the scrap plaster ceiling, opened and removed all walls that were porous or wood.Figured we should do that anyway in case there was an animal in the ceiling. There wasn't. All that's left now is the brick foundation and masonry block infill, the HWH, and the furnace and its pipe system. ask the installers for their combustion analysis report. aldyhydes have been known to be described as sweet smelling. It's doubtful that the system was switched from hot water to steam. No chemicals added as far as we know but will double check. Will add smoke pipe, chimney, and floor drain to the list...No sump in this basement. HWH is in the same area as the boiler. We really do need to see pictures of the boiler, the piping above and around it and a picture that is representative of the radiators. Those little handles you describe could mean this is a two pipe steam system or it could be a bleeder valve for what might have been a hot water system. 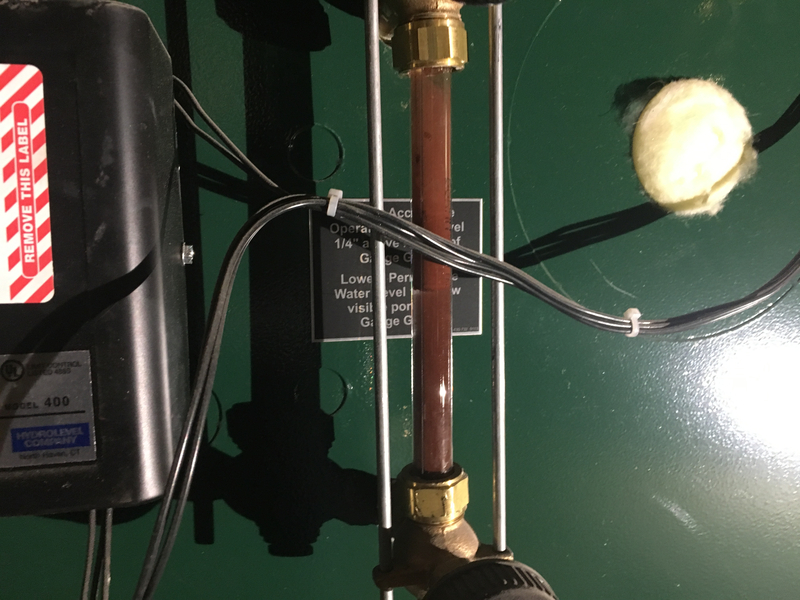 I can't imagine that your installer would have mistaken the system and installed a steam boiler if it was really hot water but almost anything is possible. 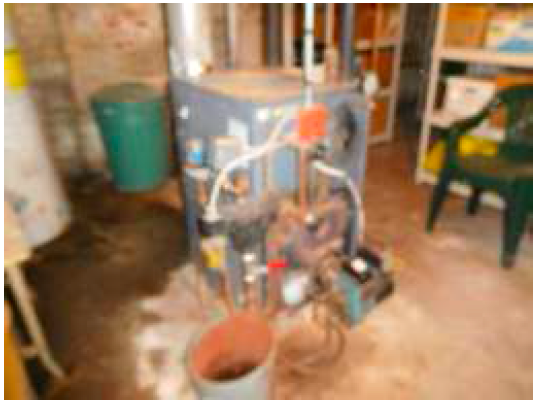 Tough to tell from the blurry picture of the boiler but it looks like a steam boiler. Sight glass low water cut off etc..
Another radiator. We just aren't familiar with these handles, and pipes on both ends. Our current house has a pipe on one end of the rad with a steam valve on the opposite end. This is a two pipe steam system. The old boiler looks like it may have been an oil fired system. The new one looks like natural gas. Is that correct? If so, and they vented it into the chimney without a new liner, what you smell may be old oily soot in the chimney burning off. Yeah, we are grasping at straws here. Just trying to work our way forward from the first time the smell was noticed, which was the day after the new furnace was installed. New chimney lining went in 11 days later but it already smelled by then. BTW, We still can't see how the new boiler is piped. Need to see piping above the boiler. This is the full install of new system. We love our plumber so we really doubt there was some weird error...just trying to work through the options. Our inspector said maybe the water in the system is nasty and spilled into the floor, but the floor isn't really wet. We can only smell-test for about fifteen minutes before we get overwhelmed so it's taking some time to track it down with our noses. The water in the sight glass looks murky, and colored-maybe some chemical agents were put in to substitute for a proper cleaning. I can't see where the steam main ties into the new header or did he just tie that top horizontal pipe directly into the main? I also don't see an equalizer. Did he use galvanized pipe for that riser out of the boiler and the horizontal pipe? It should be black iron. The galvanized coating on that pipe may well be the smell. 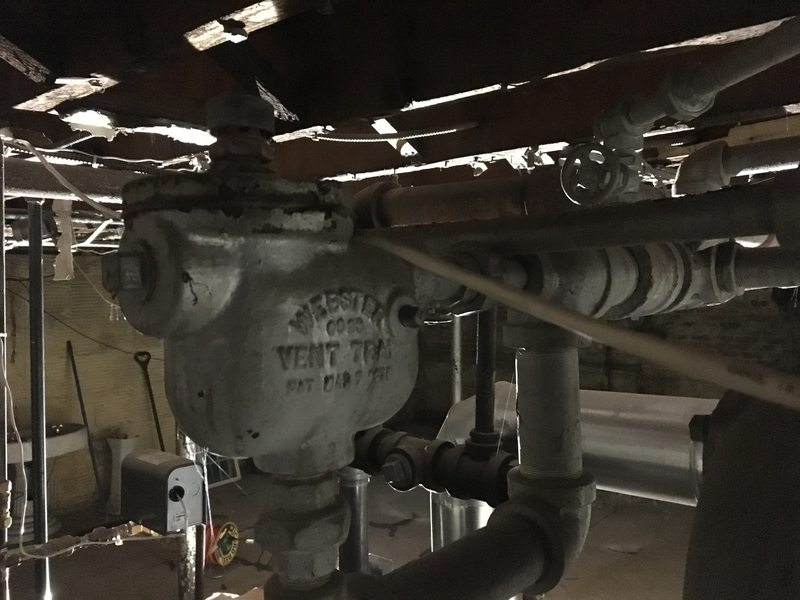 I'm sure you really like your plumber but if he is not knowledgeable with steam systems, especially two pipe steam systems, he is not doing you any favors. If He's a plumber, use him for plumbing and check the "Find a Contractor" tab at the top of this page to find a steam Pro. Where are you located? We may be able to tell you who to call. Well, that is good to hear. What's weird is you can smell this awful stink if you sniff the top of the furnace, too...so we wondered if it was something "burning off" but this has been running for almost 3 weeks now in very cold temps. I also see the Pressuretrol is set WAY, WAY too high. Use the screw on the top of that gray box and turn the "Cut-In" to .5 (at the bottom of that scale) then take the cover off of that box and make sure the white wheel inside is set to "1" facing the front of the box. My guess is no one bother to measure the EDR of your radiators either. That's a large boiler and I bet it is way over sized for the connected EDR. Well, he has 35 years experience in our area (Maplewood/SO, NJ)...mainly with these old homes. He stopped by yesterday when we told him about the issue and agreed that the smell was not right coming off the furnace. We have snow coming so we said we'd let him know on Monday if the smell was the same, and he'll come back to troubleshoot. I'll add your comments to our list to ask re: pipes, as my husband's on his way home now. Thank you for all the ideas. I don't know if this image helps, but this is from the other side of the boiler looking at the pipes. That's a Webster Vapor system. I know it needs a Vaporstat, rather than a Pressuretrol but @Steamhead and @Jamie Hall can tell you all you need to know and check out on that system. Pictures aren't that great but it doesn't look like it is piped correctly, still. Okay. We will turn the screw and open the box tomorrow (as long as we aren't snowed in). We know they measured the radiators before selecting the boiler...what does EDR stand for? And it looks like the boiler was never skimmed either seeing that the skim port was never removed. 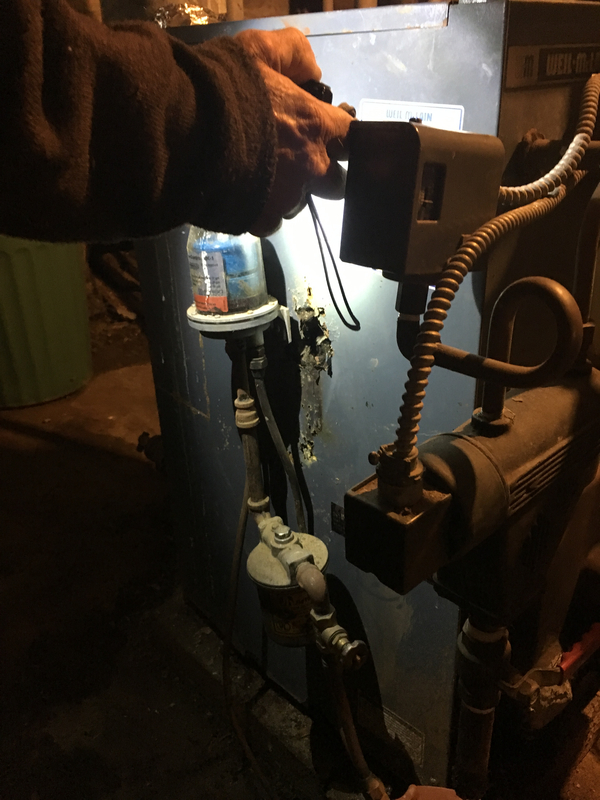 That boiler installation will fail inspection due to the part that the backflow preventer is after the automatic feeder. Okay. All of that stuff was there before we put in the new furnace, so we'll make sure to re-assess that, too. Thank you, Fred!